BORN: 1826 in "Springfields", near Louisville, KY.
DIED: 1879 in New York City, NY. CAMPAIGNS: Shenandoah Valley, Seven Days, Mansfield, Red River, Mobile. (Last major surrender of Confederate forces east of the Mississippi). Richard Taylor was born on January 27, 1826, at "Springfields," near Louisville, Kentucky. The son of former President Zachary Taylor, he was educated in Europe, then at Harvard and Yale. Taylor was also the former brother-in-law of future Confederate President Jefferson Davis, and a powerful planter and Louisiana state senator. 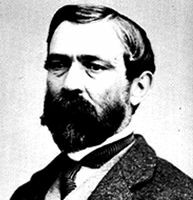 He joined the Confederacy and , with almost no previous military experience, took command of the 9th Louisiana Infantry Regiment in July of 1861. Proving himself an able combat commander, he was promoted to brigadier general on October 21, 1861, major general on July 28, 1862 and lieutenant general to rank from April 8, 1864. He served in Virginia, Mississippi and Louisiana, and is remembered for his victory over Maj. Gen. Nathaniel P. Banks at Mansfield, Louisiana and his successes in the Red River Campaign. After the Civil War, Taylor wrote his "Destruction and Reconstruction" (1879). The memoir was published a week before his death in New York City, on April 12, 1879.